I'm impressed with the way garbage is dealt with here. All recyclable packaging and containers are collected free of charge every other week and there's a weekly collection of 'real' garbage, which costs $2 per bag. You buy little blue labels in advance and stick them on the bags when you put them out. As the recycling is so comprehensive, we find we're only generating one bag of rubbish a fortnight - so we spend $52 a year (£26) for this service, which seems reasonable. I've been composting all the vegetable waste we produce in two plastic compost bins that were here when we arrived, but it seems this isn't that common a practice here. Recently the County advertised in the local paper, asking people to apply for a rotating composter as part of a County-wide trial. I've always fancied one of those, so I applied and was thrilled to find out the other week that I had been selected to take part, along with 19 other households around the County (75 applications had been received in all). Last night there was a meeting about the trial and I got to collect my new toy. There were some interesting talks, including one from Doug Parker, who farms on an organically-certified farm in South Marysburgh. It was great to listen to someone who is so passionate about compost (which, by the way, is mainly pronounced to rhyme with 'post' around here). He had even brought some of his compost along for everyone to examine. 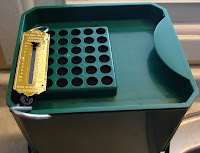 Then two representatives of the manufacturers described the features of the composter. It's supposed to be pest-proof (which is good, as we had a rat living in our compost bin in Sale for a while), although they had heard of one installation in Vermont which was regularly played with by a bear. 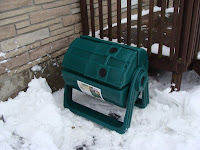 This morning Mike and I set up the composter and I placed it next to the back door (this involved shovelling out a big snow drift). It's made by Sun-Mar, who started out making composting toilets and this is built on the same principles. The rotating drum speeds up the composting process, so that compost can be extracted from the centre in as little as two to four weeks. Although it might have to get a bit warmer outside before that's achievable, I suspect. The retail price of one of these is $250. I've paid $50 to take part in the trial, but I think $30 of that is refundable at the end of it, so I'll get my composter for $20. Bargain!